This Arugula, Pomegranate and Pear Salad is perfect for fall with pears, poms, red grapes and a delicious poppy seed apple cider dressing. This recipe has been evolving for a while now, but it’s definitely become a “go-to” in my fall repertoire. Although I’m forever trying and creating new recipes (sometimes great successes, sometimes not so much), I love having one or two “standbys” that I can serve with great confidence. This Arugula, Pomegranate and Pear Salad is one of those never-fail winners! I tried lots of variations before settling on this wonderful combination as my new “standby” and it’s quickly become a favorite here at The Café. That’s why I’m sharing it with you, I figured you too, could use a super fresh, super versatile and super delicious salad. It’s perfect to add a bit of pizzaz to family dinners, amazing for work or school lunches and will be a real show stopper at your next dinner party. We’ve also enjoyed this Arugula, Pomegranate and Pear Salad as a main course, with rotisserie chicken. And it would pair quite nicely with shrimp, grilled steaks or roasted pork. The main cast of characters includes peppery arugula, sweet sliced pears, juicy red grapes, creamy goat cheese and a scatter of ruby red pomegranate arils. But do you want to know what makes this salad shine? There are actually three delicious components that take it out of the realm of ordinary. Are you ready for “the stars”? Pickled Red Onions. If you haven’t tried these guys yet, you won’t believe what you’ve been missing. They only take a few minutes to throw together and last for several weeks in the fridge. They’re wonderful for adding a gourmet touch to sandwiches, wraps, tacos, burritos, burgers. Oh, and there’s a magical color metamorphosis that occurs almost as soon as the sliced onions are placed in the flavorful brine, taking them from plain-Jane-everyday to rose-hued ribbons of deliciousness. Scatter a few on top of a salad and you’ve just transformed simple greens into a work of art! 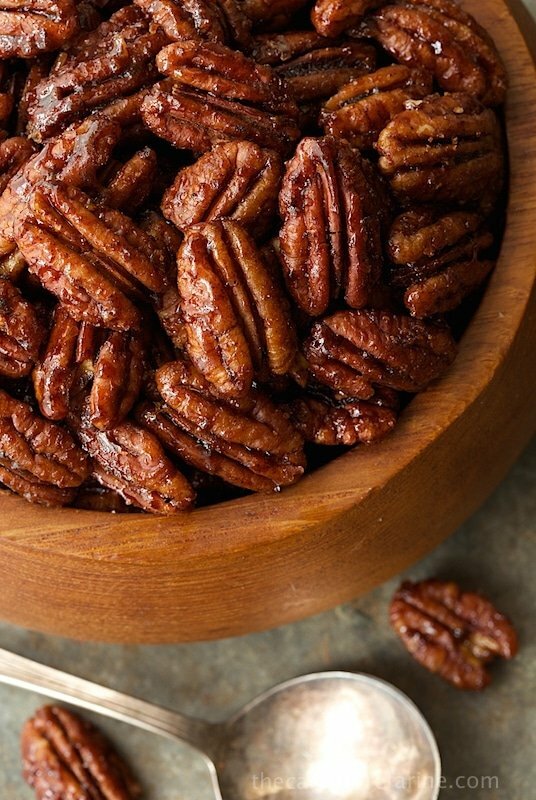 Sweet and Spicy Maple Pecans. These are amazing. And addictively delicious. Oven roasted with real maple syrup, fall spices and a touch of chili powder, they add crunch and sweet-salty-spiciness to yogurt, oatmeal and other breakfast cereals. They also make a fabulous snack, ice cream topping or pre-dinner nibble. Scattered on top of this Arugula, Pomegranate and Pear Salad, they’re not only pretty as a picture, but add another layer of fabulous flavor and texture. Poppy Seed Cider Dressing. The salad’s crowning glory, (or if you’re French, crème de la crème!). Apple cider is simmered till it’s reduced to a thick, sticky syrup that’s, literally, bursting with vibrant apple flavor. The syrup is then combined with a splash of apple cider vinegar, a touch of Dijon mustard, garlic, olive oil and a spoonful of poppy seeds. Everything goes in a jar and then – shake, shake, shake for a flavorful fall dressing that’s the perfect complement and conclusion to this yummy salad. These star ingredients can all be made ahead, so it’s easy to throw this salad together at the spur of the moment. I usually double the dressing recipe and keep jars of the wonderful pecans in the freezer. When I use the last of the Pickled Red Onions, it doesn’t take long before a new batch is on its way. Like I said, this Arugula, Pomegranate and Pear Salad has become my go-to salad and I’m sure that once you try it, you’ll find yourself making it again and again as too! P.S. Have you noticed that pomegranates are starting to show up in the markets. Lots of my local stores are starting to have specials on them. This salad includes the gorgeous ruby red pomegranate arils (or seeds). Do you avoid pomegranates because they’re a pain to de-seed? Are you intimidated by them? I used to be until I discovered this super easy No Fuss, No Mess, No Water technique. Now they grace my table quite frequently this time of year. And it takes less than a minute to go from the whole fruit to a jarful of the lovely seeds! Combine all salad ingredients except the pecans in a large serving bowl or arrange on individual serving plates. Drizzle with the Cider-Poppy Seed Dressing. Scatter the pecans over the top. Serve immediately. For the dressing, place apple cider in a small sauce pan. Bring to a boil, then reduce to a steady simmer. Simmer for 15-20 minutes or until cider is reduced to 1/4 cup. Cool. When cider reduction has cooled, transfer it to a medium size glass jar. Add the remaining dressing ingredients and cover the jar with a secure lid. Shake vigorously till well combined. Store in the refrigerator. Keeps well for 1-2 weeks. Nutrition facts do not include information for the Sweet and Spicy Maple Pecans. I really want to try this salad, but is there a good substitution for the goat cheese? I can’t tolerate it, blue cheese, or feta cheese. Any ideas that wouldn’t change up the beautiful salad too much? Hi Michelle, this salad would be fantastic without any cheese. If you can’t tolerate cheese, definitely leave it out. I promise it will still be a huge hit! I served this salad recently for a few of my girlfriends. They oohed and ahhed when they tasted it! It is now “a keeper!” Thanks for posting the recipe! You’re very welcome Kim! We love this salad too! I made this salad yesterday, for Thanksgiving. AHHHHmazing!!!! The flavors all worked so well together. I can’t wait to make and share this again! That’s awesome Michelle! Thanks for sharing your comment! Hi Charlotte, the recipe for the dressing is included. Beautiful salad with such wonderful textures and flavors. I haven’t even had my morning coffee yet and I’m ready for a big plateful of this beautiful salad. The colors and textures are not only stunning they are so appetizing too… my mouth water just looking at this salad. Love the combination of crispy pecans and juicy pears. This salad is really tempting, Chris!!!! Oh! Do please make me a salad! This looks so fresh and amazing!! Yum!! So glad to finally get Cafe deliveries again. Missed them since September but kept up on Pinterest. Thanks Cheryl, we’re happy to have a much more reliable email provider. I love your salads. I could make a meal of them. I need to borrow your organizational skills…what I wouldn’t give to have those maple pecans in my freezer and your dressing and pickled onions in my fridge. Dorie Greenspan introduced me to pickled onions…so easy and perfect for a salad as I prefer these to biting into a sharp raw onion. Delectable, my friend!!! vibrant and gorgeous as always!! hope to try out this poppyseed dressing too someday! A stunning salad ~ must try asap & pinned! I definitely would call this a show-stopper. What a gorgeous salad. Scott really nailed it with the “pour shot” in the first photo too. Wow. I just bought a HUGE pomegranate and some wild arugula..this seems like a perfect recipe to use them. Your salad looks tantalizing and beautiful! HI Chris, love all the different components of this salad especially the poppy dressing. Beautiful salad, Chris! These are some of my favorite flavors for fall! I love everything about this salad, Chris. All of the ingredients I love in a salad. This sounds lovely, I especially like to addition of the poppy seeds in the dressing! Kinda bringing summer and fall together!